These efforts include our popular community training courses such as Community Emergency Response Team (CERT). More information is available below on our "CERT" tab. The Fire Department's Office of Emergency Management and Volunteer Services is responsible for minimizing the impact of natural and man-made disasters by establishing readiness through city-wide prevention, preparedness, response, recovery and mitigation. This includes coordinating and conducting drills for the City's Emergency Operations Center (EOC) as well as providing a wide variety of training to both employees including Community Emergency Response Team (CERT) training, Terrorism Awareness training, and emergency preparedness training. As part of the Moreno Valley Fire Department, and hence the Riverside County Fire Department, it is critical that the City’s Office of Emergency Management collaborates projects, emergency management grants, emergency management exercises, and the management of declared local disasters with the Riverside County Fire Department Office of Emergency Services. Having an integrated, cooperative approach for addressing regional disasters benefits the community as resources can be allocated to areas where they are most critically needed during a major incident. This web site has a series of informative articles that give practical advice for surviving and preparing for natural emergencies as well as a list of local emergency numbers and online resources. To learn more about emergency management services and programs, select a tab below. The City of Moreno Valley places a high priority on being prepared for emergencies and disasters. To help residents prepare for emergencies, the City provides Community Emergency Response Team (CERT) training at a minimal cost. Interested citizens may also want to consider joining the Emergency Response Force (ERF) and/or ACES/RACES (emergency HAM communications group). 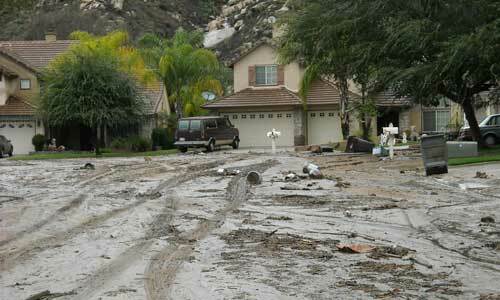 The 2017 City of Moreno Valley Local Hazard Mitigation Plan (LHMP) is designed to reduce or eliminate the long-term natural or man-made hazard risks to human life and property. The LHMP is written so that all stakeholders can understand Moreno Valley's hazard risks and the city's corresponding mitigation strategy. Hazard mitigation responsibility rests with everyone. The City of Moreno Valley encourages its citizens to do mitigation planning at every level - at home, in the workplace and in their communities. Key components of the plan include hazard identification, asset inventory, risk analysis, loss estimation, and a mitigation strategy to reduce the effects of the hazards we have. The purpose of the Riverside County Operational Area Mass Care and Shelter Guidance and Annex for Emergency Planners is to establish plans, procedures and guidelines for providing protective shelters, temporary lodging and feeding of persons affected by an emergency, disaster, or precautionary evacuation. The City of Moreno Valley Emergency Operations Center (EOC) is a centralized location for decision making about our jurisdiction’s emergency response. The EOC is where our emergency response actions can be managed and resource allocations and responses can be tracked and coordinated with the field, operational area, and OES region. City of Moreno Valley Emergency Operations Center (EOC) staff are organized around the five Standardized Emergency Management System (SEMS) functions. EOC staff are asked to refer to our Standardized Operating Procedures (SOP) manual for position descriptions and checklists. To activate our EOC 24 hours a day, EOC staff work 12-hour shifts with two staff members trained to work each position. Each 12-hour shift is considered an Operational Period. Several briefings with EOC staff are held each Operational Period. During each EOC briefing, the staff coordinates information and sets priorities for mitigating the situation and returning the city to normal operations. Communications and coordination will occur between the Incident Commander(s) and the EOC. Moreno Valley EOC staff will also communicate and coordinate with the Riverside County Operational Area EOC and other EOCs within Riverside County. EOC staff facilitate decisions for overall local government level emergency response activities will use multi-agency or inter-agency coordination. If mutual aid is required, the City of Moreno Valley will request it through the Riverside County Operational Area EOC. Management Section is responsible for overall emergency policy decisions such as proclaiming a Local Emergency, recommending a city ordinance and disseminating information to the public. The Management Section includes the following positions: EOC Director, EOC Manager, Liaison Officer, City Attorney, Public Information Officer (PIO), Safety Officer and Security Officer. 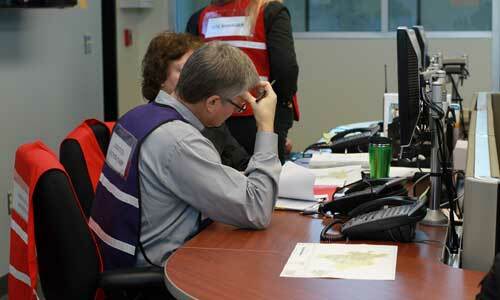 Operations Section is responsible for coordinating all field operations in support of the emergency. The Operations Section includes the following positions: Operations Section Chief; Public Works/Utilities Branch Coordinator and Construction/Engineering, Maintenance/Ops, and Damage Assessment Unit Leaders; Community Services Branch Coordinator and Medical/Health, Care & Shelter, and Animal Shelter Unit Leaders; Fire & Rescue Branch Coordinator and HazMat and Search & Rescue Unit Leaders; and Law Enforcement Branch Coordinator and Coroner, and Evacuation Unit Leaders. Planning/Intelligence Section is responsible for collecting, evaluating, and disseminating information, developing an Action Plan every 12-hour period during activation, and documentation. The Planning/Intelligence Section includes the following positions: Planning/Intelligence Section Chief, Advance Planning Unit Leader, Documentation/Recovery Unit Leader, Situation Assessment Unit Leader, Message Center Unit Leader, EOC Operators, EOC Runners. Logistics Section is responsible for providing and maintaining facilities, services, personnel, equipment, and materials. The Logistics Section includes the following positions: Logistics Section Chief, Communications/Information Unit Leader, Facilities Coordinator Unit Leader, Personnel Unit Leader, Supply/Procurement Unit Leader and Transportation Unit Leader. Finance Section is responsible for financial activities such as tracking emergency hours, compensation and claims, and overall emergency costs. The Finance Section includes the following positions: Finance Section Chief, Time Keeping Unit Leader, Comp/Claims Unit Leader, Cost Recovery Unit Leader, and Purchasing Unit Leader. For more information please contact us at 951.413.3800 or email oem@moval.org. Through CERT training, the City provides information to citizens about being prepared to handle disasters and how to reduce the risk of hazards in and around the home. 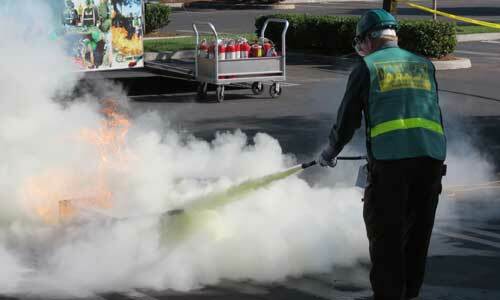 CERT teaches disaster preparedness. CERT also teaches life saving skills, with emphasis on decision making, rescuer safety and doing the greatest good for the greatest number of people. Lifesaving skills include first aid, sizing up hazards, fire suppression and light search and rescue. 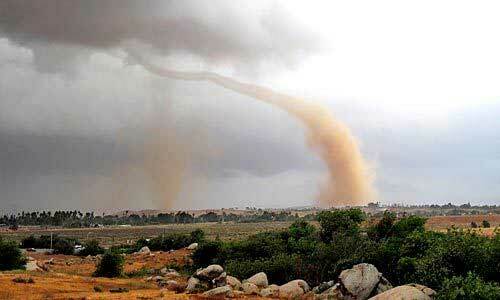 What would you do if disaster knocked at your door? Don't know? Find out how to be prepared, save lives, and work effectively with emergency responders. Friday, October 11: 6 p.m. – 9:30 p.m.
Saturday, October 12: 8 a.m. – 5 p.m.
Sunday, October 13: 8 a.m. – 5 p.m.
Friday, August 16: 6 p.m. – 9:30 p.m.
Saturday, August 17: 8 a.m. – 5 p.m.
Sunday, August 18: 8 a.m. – 5 p.m.
Friday, May 3: 6 p.m. – 9:30 p.m.
Saturday, May 4: 8 a.m. – 5 p.m.
Sunday, May 5: 8 a.m. – 5 p.m. The Emergency Response Force (ERF) is an emergency management volunteer program supervised by the Office of Emergency Management and Volunteer Services. Members consist of trained individuals who typically have a background in CPR and first aid and emergency response. Regardless of their background, all ERF members are trained to provide emergency care. Emergency Response Force members may be called out to respond to structure and vegetation fires; hazardous materials incidents; multi-casualty incidents; mass care and shelter; evacuations; and other emergencies. ERF members are trained to provide emergency rehabilitation for public safety personnel, which includes blood pressure, pulse and respiration monitoring if required; evacuation assistance; shelter set-up and management; search and rescue; and first aid for emergency and special events. For more information contact: 951.413.3800 or email oem@moval.org. Moreno Valley ACES/RACES is an emergency management volunteer program supervised by the Office of Emergency Management. Utilizing state of the art ham radio technology, they provide vital communications support during emergency incidents and routine events and activities. MV ACES/RACES Meetings: are held on the 2nd Wednesday of every month at 7:00 p.m. 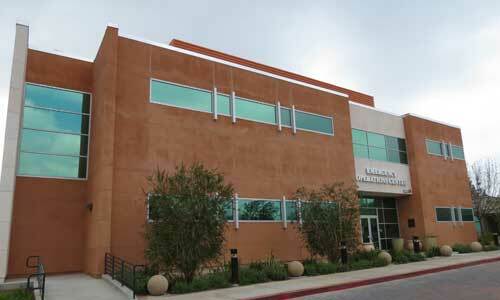 The meetings are located at: Moreno Valley Emergency Operations Center, 22870 Calle San Juan De Los Lagos. We encourage you to check in during our weekly net, which is held every Wednesday at 7:00 p.m. Weekly net frequency is: 147.510 Simplex Primary Frequency and 146.595 Simplex Secondary. 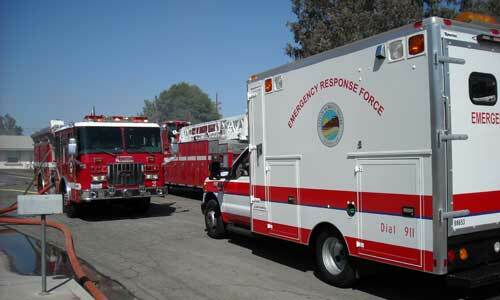 MV ACES/RACES participates in the City of Moreno Valley’s annual full-scale disaster exercises. 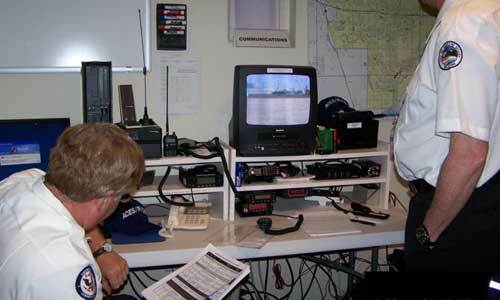 The team provides emergency communications in the field and in the Emergency Operations Center (EOC). The team provides a show-and-tell by displaying our MV ACES/RACES Emergency Communications trailer at this annual event, located at March Air Reserve Base. This is a great way for members to show off their ham radio knowledge and encourage others to join our team. Members of our MV ACES/RACES team provide ham radio communications during the 4th of July parade. The team provides each of the announcers throughout the parade route with updates to the parade script. In the afternoon, members conduct a show-and-tell by displaying our Emergency Communications trailer and demonstrating our ham radio equipment. MV ACES/RACES members bring our Emergency Communications trailer and generator to participate in the annual Ham Radio Field Day, which is a 24 hour amateur radio exercise held simultaneously throughout the nation. We hold this event on the last full weekend in June each year at Moreno Valley Community Park. The City of Moreno Valley’s Emergency Alert and Warning Notification System is utilized to rapidly send notifications to all residents and businesses in an affected area in the event of an emergency or disaster. Residents have an option when registering their information to receive notifications through their landline, cell phone, text message and/or email. For phones, the system will automatically call listed and unlisted telephone numbers within the area affected by the emergency and deliver a recorded message. If phone lines are busy, the system will attempt to redial those telephone numbers to make contact. If an answering machine picks up the call, the emergency message will be left on the machine. The City of Moreno Valley uses both the Standardized Emergency Management System (SEMS) and the National Incident Management System (NIMS) when responding to emergencies. Learn about SEMS/NIMS through this informative Power Point slide show. Note: You will need either Power Point or the Power Point viewer to view the slides. See a map of the earthquake faults in California.